Horizon Hobby has just announced their revolutionary new stabilization that gives amazing control response, stability and performance to their new UMX micro flyers. The built-inAS3X System invisibly helps you enjoy the kind of silky handling and outstanding control you always wanted from a conveniently sized RC model, but never thought possible before now. And you get all the benefits without having to spend a lot of setup time. No special programming is required. 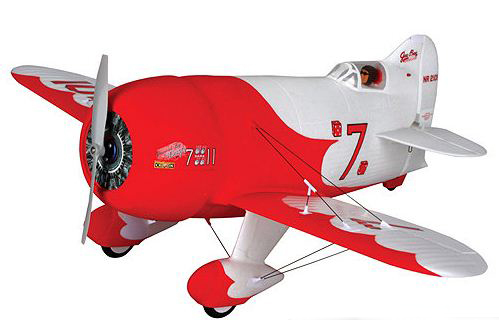 The AS3X system is included in the new UMX Gee Bee R2 BNF (above), UMX Beast 3D BNF Basic and the the UMX Hyper Taxi BNF all from E-flite. It would be great if this system can be adapted to work with the bigger models. It really would be nice to have something like this in the park plane range. I looks amazing. I will be buying one soon. Please, lets have one of these for the big stuff. We asked the folks at Horizon about this, and although there’s no telling where this technology will lead, they note that the biggest performance differences were with small micro models, which can be “twitchy” and are more affected by wind, etc. This is more like an advertorial than a true article. What exactly is AS3X? What does it actually do? More & more I find Horizon products being shown in the ” What’s New ” sections of magazines that have been around for some time, and other concerning issues that have me questioning the legitimacy of the magazines. You’re right — this isn’t an article, just a press release! We’re looking forward to being able to test this new system in a Beast biplane soon. Please note that there is a lag time with printed material, so when we put an item into the “what’s new” section immediately, you’ll see it in the magazine a month or two after the information has been released online. Keep coming to http://www.ModelAirplaneNews.com for the latest scoops! So it comes with the plane – can’t be moved to other planes? Can it be disabled? Looks like a great system! An old guy like me needs all the help he can get. Wish they would have a more beginner plane with the AS3X in the lineup. Nonetheless, amazing technology and I hope this expands quickly! All this and nothing about the actual stabilization system? The system is built into the receiver and is unique to each aircraft. It cannot be turned off or on. Horizon plans to eventually have independent systems available that you can program to suit your type of model (for scratch-builders). Install gyros on your “bigger models” elevator and ailerons and you will have the same results, a “stabilized” plane. The magic of the AS3X is it’s micro size. Perfect for making nitsy-bitsy little planes fly like larger planes. I now have the yak and the beast micro. However the AS3X system does not agree with my radio. Sometimes the planes fly well. Other times they get 30ft. and roll over and speed out of control. causing damage to the planes. I use the Orange T-six transmitter. This is an expensive problem on my end that I wish HH would address. The consumer should be able to turn off the system. I have flown the yak with the Dx4E and had no problems. But the plane does not fly to its fullest with that radio. I was so happy to make the purchases and was so excited to fly them. Now I just wait for the disappointment to crash in front of me. I also fly T-28, Crack yak, edge 540QQ, as well as the super cub all with no problems. Only the beast and yak with the AS3X system fail.